My daughter and I had THE most phenomenally helpful trip to PSP on Alpine at 4 Mile in Grand Rapids, MI earlier tonight. 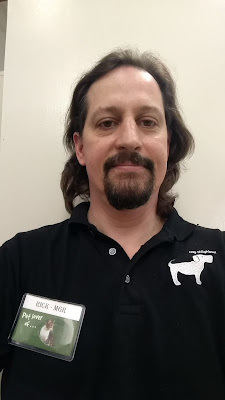 We did not have our dog with us, but nonetheless were warmly greeted by the cashier, then approached by one of the newer co-managers inquiring what, if anything in particular, he could help us find. We went in for a small bag of dog food since I brain-flopped before leaving work where I normally purchase my dog's food. The gentleman was VERY knowledgeable about all of the dog food on the shelves, asked if there were certain ingredients we were looking for or did not want in the food (which is awesome because my dog is allergic to chicken and eats the grain-free, soy-free, whatever whatever food.) When I mentioned to him that our dog was allergic to chicken and has been fed a grain free, soy free, corn free, salmon and pea recipe food because of her chicken allergy, he immediately steered us away from all food with ANY type of fowl-chicken, turkey, duck-and found us a bag of Hills Whitefish & Mixed Veggie food that was about $10. Our dog LOVES it. Our only other item of actual business there was to find an elk antler for the dog: she has synthetic Nyla bones but has had an elk antler in the past and, unfortunately, I lost it. The manager took us directly to the aisle where the antlers are kept and, even though truck was delivered this morning, the antlers were almost completely sold out! When I mentioned that our girl is an aggressive chewer I was introduced to 3 very interesting products, 2 of which I purchased. The first was an animal horn of some sort (bison, sheep...I don't remember) which I had never seen before, the 2nd was a product I had actually seen on an episode of the show "Shark Tank," and the 3rd was a digestible Nyla bone, solid as a rock. I was completely intrigued by the horn, obviously, and had every piece of relatable information about it give to me. Sold. I passed on the "Shark Tank" product because I KNOW my dog would devour it in a minute, but also ended up purchasing the edible, digestible Nyla bone because I'd never seen them before and given the rock solid strength of it, it seemed like a good product. After choosing the items I'd come in to buy, the manager I was helped by the ENTIRE time asked if I had any other questions or if I had other animals that I needed to purchase anything for. I told him I was pretty confident with what we'd decided on purchasing and thanked him for his help, and he proceeded to shake not only MY hand, which has NEVER happened to me before, but also shook my 7 year old daughter's hand, thanked us for coming in, encouraged us to have fun watching our dog try her new chew toys out, and asked us to please ask him or any other store employee if we needed any help. He was above and beyond helpful, knowledgeable, friendly, and focused on us. We also had a chance to encounter two additional sales floor employees who were equally as helpful, as well as the cashier who chatted with us while ringing our items up as though she'd known my daughter and myself for years!! !